A Series of Greeting Cards By Jacob Elijah. Fun, colorful, twisted and warped, just a few of the things that come to mind when seeing an Oddly Greeted holiday card. Oddly Greeted cards are dark humor in the most fun way possible. Twisting the common concepts of the holidays around in an entertaining way. 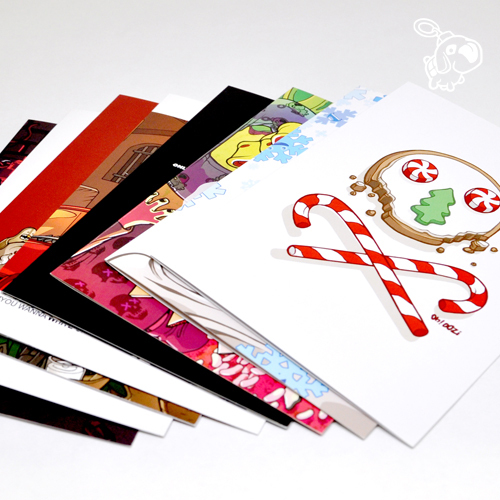 The debut series Launched during the 2015 holiday season, with 10 full color quality cards. New card for 2016: Xmaszilla! Note: Cards are only available during the winter holidays. Created and Illustrated by Jacob Elijah. Xmaszilla (Full double sided art) New Greeting card for 2016!